In the output VCF of GenotypeGVCFs, there are 0|1, 1|0, 1|1 and . for PGT, and no 0|0. When seeing a . for PGT, I feel uncertain, as I don't know whether it is actually a 0|0 or missing data (e.g. due to zero useful coverage at the position). So it will be great if GenotypeGVCFs can also output the 0|0. It would take a bit of rewiring that we don't have time for right now, I'm afraid. Anyway the rule of '.' or './.' signifying no-call due to having no informative data only applies to GT; for other fields the '.' does not carry that meaning. So you can simply rely on the content of the GT field to know whether there is a call or no-call. Are you using -allSites in you GenotypeGVCFs command? Can you post a few example records of the . in the PGT field? No, I am not using -allSites in my GenotypeGVCFs command, and my understanding is that the -allSites option has nothing to do with PGT (please correct me if I am wrong). As I mentioned in my previous post, there is no 0|0 PGT output at all. If I want 0|0 output, do I need to turn on a specific option for HaplotypeCaller or GenotypeGVCFs? Or that is not yet implemented with HaplotypeCaller and GenotypeGVCFs? I think this is a representation issue. Let me check with the team and get back to you. Basically, sample 1 and sample 3 are phased at those two sites, but since sample 2 is homozygous reference at the second site, it is not phased. Can you please post the original bam file and bamout file of the region for sample 2? 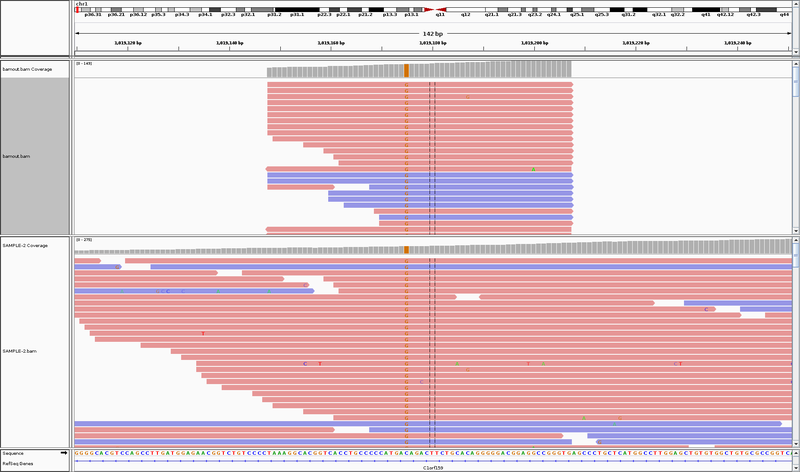 The original bam and "bamout file" of Sample-2 are attached: The HOM-ALT site is the first site, and the vertical center lines are at the second site. Can you post the full records (not just genotype fields) including the record that comes before the two that you are showing? Hi Geraldine, please see the attached vcf.gz file. Please post the records as a text comment. It takes less time for us to look at it that way. Also I can't access the file easily from a smartphone (which is what I use a lot of the time for answering support questions). Sorry for the late response. These records look ok; the second sample does not have phasing information because it is hom-ref at the second site. We don't output phasing information at hom-ref sites. To have phasing info for the second sample you would have to have another site where it has a variant allele. Thanks for your response. It is just a feature request and I think it will make the output better. In the output of GenotypeGVCFs, there is . but no 0|0 for PGT. And we know . can stand for missing data (e.g. due to zero useful coverage at the position). For example, after I used GATK's VariantsToTable to extract PGT and save them in TSV format (see below), I saw so many NA for PGT, and I don't know whether they are 0|0 or missing data. So it will be better if 0|0 can be output for PGT too. Thanks!